The church in Laodicea is the seventh and last of the churches described in Revelation chapters 2 and 3. The ancient city of Laodicea was located near the present city of Eski-hisar, 45 miles SE of Phildelphia and 40 miles east of Ephesus. It was near the temple of Men Karou where there was a well-known school of medicine and it exported a famous eye powder. It was also a strong financial center and was known in Roman times as one of the richest cities of the east. In 60 AD (or 61 or 66 AD, depending who you read), it was largely destroyed by an earthquake but refused outside help, basically saying "I can do it (the repairs) by myself." It was also in an area that raised lots of black sheep and produced black wool and black garments. It could be thought of as "the black sheep" of the family of seven churches. 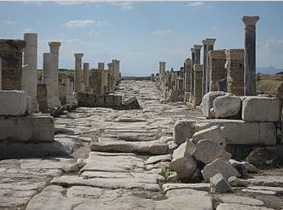 The church of Laodicea was the last of the seven churches. Laodicea means "a people judged" which helps promote the idea that it represents the church at the end, during a time of judgment. It also has a reputation of being the worst of the churches especially because of the expression " I will spue thee out of my mouth" (verse 16). It is commonly thought of representing the church in the last days which would then include Christians reading this. Is that bad - to be part of the church of Laodicea or does it necessarily mean that? The previous church in the messages to the seven churches of Revelation, that of Philadelphia, received no rebuke but that does not mean everyone covered by that church will be saved. In contrast, the church of Laodicea had plenty of rebuke and no commendation but does that mean they all will be lost? Not necessarily; we, as individuals, determine our destiny by our choices. But the message to the church of Laodicea does include important information for Christians living near the end of time. "Amen" is often translated as "verily," from Hebrew meaning "in truth." The "faithful witness" refers back to the description of Christ in chapter 1, verse 5. The word "beginning" is from the Greek word "arche" which refers to Christ as the One who began creation not that He was the first being created. It could have been translated as "the One who began" or "the beginner of." We have here three descriptors of spiritual condition: hot, cold and lukewarm. We could ask what is God's preference as far as our spiritual temperature? We need to recognize that we cannot serve two masters and must make a definite choice as to which side we are on. Of course, God wants all to come to repentance but it is very difficult to get the self-sufficient who think they are righteous to realize their need. That realization is what needs to come first. The people Jesus was speaking to (verse 9) were not righteous they just thought they were. This can all be related to the lukewarm water that was piped to Laodicea. It started off hot from a hot spring at the city of Hierapolis 6 miles away but cooled off on the way. Why did the church of Laodicea receive such a severe rebuke? Not because they were so bad but because of their great danger. It is very dangerous to think there is nothing wrong when there is so much wrong. That is what the sin of pride can do. That is what a loving God is trying to protect His people from. The "white raiment" of course refers again to purity which is used often in scripture. In the case of the church of Laodicea, it is interesting that one of the major products in that area was black clothing made from the abundant black wool from sheep raised in the area. They were told to "anoint thine eyes with eyesalve, that thou mayest see" and that is also interesting because the area was known for producing Phrygian eye powder which helped the eyes physically but didn't do anything for their spiritual sight which is needed to comprehend spiritual things. The call here is to be "zealous" or spiritually "hot." God will even rebuke and chasten in an effort to correct a person. A person should be happy at receiving correction if they recognize that it is to steer them in a better direction or that it is helping them overcome a serious problem. In the message to the church in Philadelphia we noted Jesus' authority to open doors. There is one door He will not open. 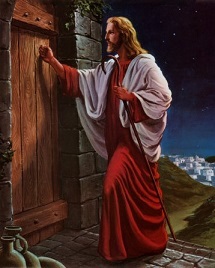 Many pictures have been made of Jesus knocking at a door with no doorknob on the outside. The message is that we have to open up to let Him in - He does not intrude His presence where it is not desired. And He is always knocking even on the heart's door of stubborn, self-sufficient members of the church of Laodicea. The question is: "are we hearing and responding to His voice?" There is an interesting connection here with a correct understanding of the relationship between the Father and the Son. If He gave His Son, He had to have a Son to give. Who is it that "is born of God" in that verse? It is not talking of Jesus being born of God but of the one who is believing. The Spirit had things to say to each church. The advice given is to anyone that has an ear to listen to what is said to the churches. We should all listen to each message because they just might apply to us too. Be especially careful that the message to the church of Laodicea does not find you lukewarm. Download a PDF chart of the messages to the seven churches of Revelation.